Above: miniature playing cards in corners. 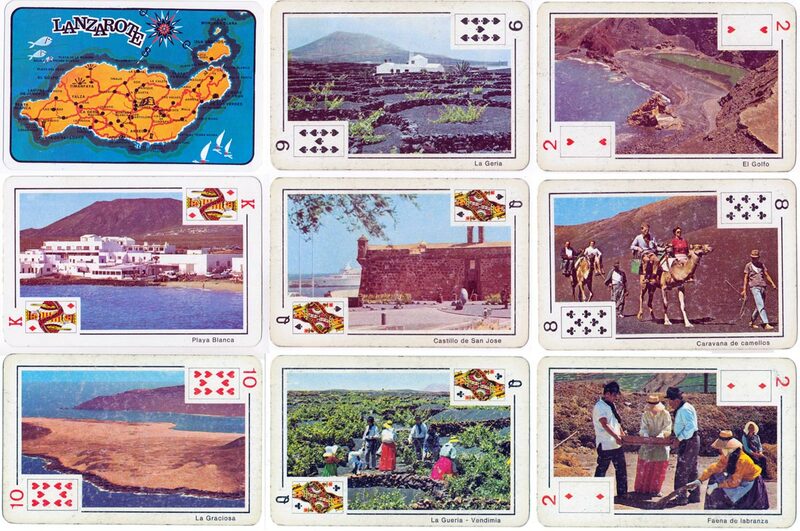 Souvenir of Lanzarote playing cards by NEGSA (Naipes Comas) with 52 colour photographs in the traditional style with miniature playing cards in the corners, which is unusual in modern souvenir decks. Oddly, the deck is packaged as a single deck but also includes a Canasta scoring system card. Above: Souvenir of Lanzarote playing cards by NEGSA (Naipes Comas), c.1966, 52 cards + 2 jokers + canasta score card. Images courtesy Matt Probert.